Sample learning tool used with the new outdoor space. Environmentalists, teachers, and designers recognize this problem and found solutions through green schoolyard design. The schoolyard is a place all children must visit on almost a daily basis. Integrating natural spaces within the schoolyard exposes children to the natural world increases the opportunity for improving ecological literacy. Young children learn through participation and experience. Kenneth Olwig relates “children’s perceptions of space to their bodily experience, and points out that child orient themselves to people and activity in the landscape rather than visual composition.” The children at the center are young, and thus have short attention spans so outdoor classroom space provides hands-on experience with the environmental topics discussed in class, increasing their comprehension. Simple, and often free, materials that offer opportunities for creativity are recycled wood, cable reels, utility poles, tires, or tree cuttings. (Hogan, 1975) Using donated or recycled materials is an option for schoolyard projects on strict budgets. The quality of all materials must be inspected to assure safety. Research and a site analysis were conducted on the toddler and pre-kindergarten portion of the playground to determine which spaces would allow children to engage with nature. Parents and faculty wanted to contribute so a Playground & Garden Committee was formed. The committee consisted of the center’s director, teachers, parents, and students. Having the support of the school’s community from the beginning was crucial to sustain this schoolyard project. The committee brainstormed ideas and contributed resources to facilitate the building of mini projects. Based on these community outreach efforts, a spiral garden, vegetable bed, butterfly corner, grass strip, Woolly Pockets ® (vertical planters), and a shade garden were chosen as the first projects to implement. The committee gathered resources and contacts to find materials, collaborated ideas on the construction of the projects and coordinated a schedule for the building. Staff and families were invited to assist in the building day, to encourage community involvement during every step of the project. The UC Davis Arboretum Teaching Nursery donated all of the plants for the construction day. Families donated materials for the vegetable bed. Without these donations, most of the projects would not have been built. 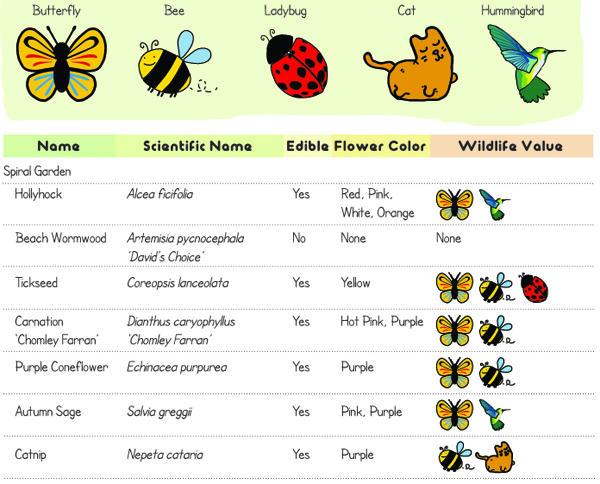 As part of this phase a plant chart was created that the teachers use as a tool to teach the children about the new plants in the school yard, their wildlife value, and colors. Another family building day was crucial to the success of Phase 2 improvements. A mural project was approved for the ninety foot wall that borders the playground. This wall is private property but the owners gave permission to the center to paint the wall. Two UC Davis graduate students, with focuses on art and the community, were asked to help. The mural featured a Davis theme where plants and animals that live in Davis can be identified by the children. This created an educational mural that the young children can relate to. The community was included in the design process; they voted on favorite designs and provided ideas. The community was also invited to the building day to paint the mural. This phase also included a bean teepee, shade garden, and additional planters. 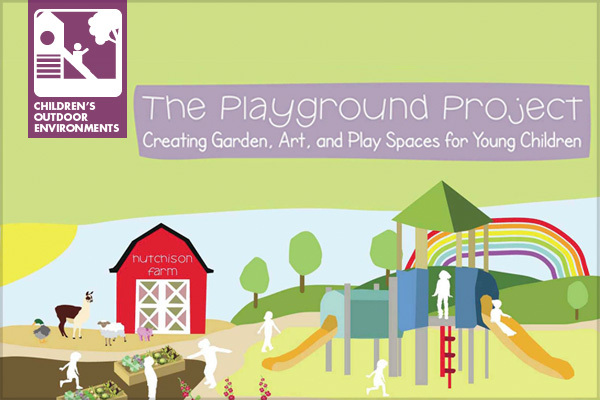 The Playground Project is the first step in Hutchison Child Development Center’s efforts to improve its playscape. There are many design elements that weren’t realized due to lack of time and budget. These future plans include a “Fairyland”, vegetated shade structure, additional plantings, vertical gardens (which provide cooling, color, texture, and possible agriculture), and free play lawn space. All in all, two successful building days were held and two graduate students designed and implemented a ninety foot mural. Most of the materials used for the project were donated. The final product is a beautiful school yard, a more connected community, and additional educational spaces. The children grow their own food, learn about plant propagation, play around and in the garden spaces, study the food web as wildlife is attracted to the garden, “paint” with plants, build bug habitats using natural elements, and learn about why the environment in their own backyard and at the center, is important. The project met all goals successfully and still has room for more opportunities. Bales, S. F. (1996). Ready, Set, Grow! : a Guide to Gardening with Children. John Wiley & Sons Inc.
Bengtsson, A. (1970). Environmental Planning for Children’s Play. Lockwood. Best-Ever Outdoor Projects. (2012). Wood Magazine. Child Care Preschool – Bright Horizons. (n.d.). Retrieved May 2012, from Bright Horizons. Danks, S. G. (2010). Asphalt to Ecosystems: Design Ideas for Schoolyard Transformation. New Village Press . Frost, J. L. (1992). Play and Playscapes. Delmar Publishers. Hart, R. A. (1997). Children’s Participation: the Theory and Practice of Involving Young Citizens in Community Development and Environmental Care. Earthscan. Hogan, P. (1975). Playgrounds for Free: The Utilization of Used and Surplus Materials in Playground Construction. MIT Press. Johnson, J. M. (2000). Design for Learning: Values, Qualities, and Processes of Enriching School Landscapes. ASLA. Olwig, K. R. (1990). Designs Upon Children’s Special Places?. Children’s Environments Quarterly 7(4): 47-53. Wong, H. H., & Moore, R. C. (1997). Natural Learning: The Life History of an Environmental Schoolyard. Mig Communications. by Liana Ramos. More information on this student led project can be found in the full-length summary online.